A new version of Evernote for Windows is available. You can download it here. Is the "add row" for tables bug introduced in previous 5.8.8.7776 build solved? Re-setting defaults and relocating data base bugs fixed? I upgraded yesterday and the outlook clipper in outlook 2013 isn't working. It pulls up a window then no notebooks show up so I can save directly to Evernote like I used to. I've tried uninstalling and reinstalling and same issue. Agreed happening to me to. Uninstalled, reinstalled, rebooted. Done the full "normal helpful advice from support" type things. Previous version worked fine got upgraded today and now I can't do this. An integral part of the Evernote offering broken. I didn't know about the upgrading anyway, I've had fatal error window all day. Totally Out of Order. The reinstallation worked for me - no relocating database, and the defaults are still in place AFAIK. Of course, YMMV, so I suggest backing up your database (copying it to a different folder) before installation. I do not work for Evernote - I just use the program. What I find really annoying is the image compression. The new Evernote Clipper is nice except when you want to add more than one tag. It is VERY SLOW in responding if you want to add multiple tags. It says this even though the note is not shared with anyone, and I have not deleted it. Outlook Clipper for 5.5.5.7837 (275837) works okay, but fails one task I often use in the Outlook clipper, clipping multiple emails at a time. I often have several emails that need to go to one general place, and it is much faster to highlight each of them and do one clip. Instead I now must select each one and clip each one. I prefer the old clipper. It was smaller and quicker. I can't get this one to work - I keep getting the error in the bottom right. This is happening this morning to me as well. Candid, I noticed that it wasn't consistent. I was able to get some of my emails sent to evernote without that error. Not sure why some work and others not. (I guess we can't insert an image in this forum when the url is google drive (https)? Only the insert link worked, not insert image). 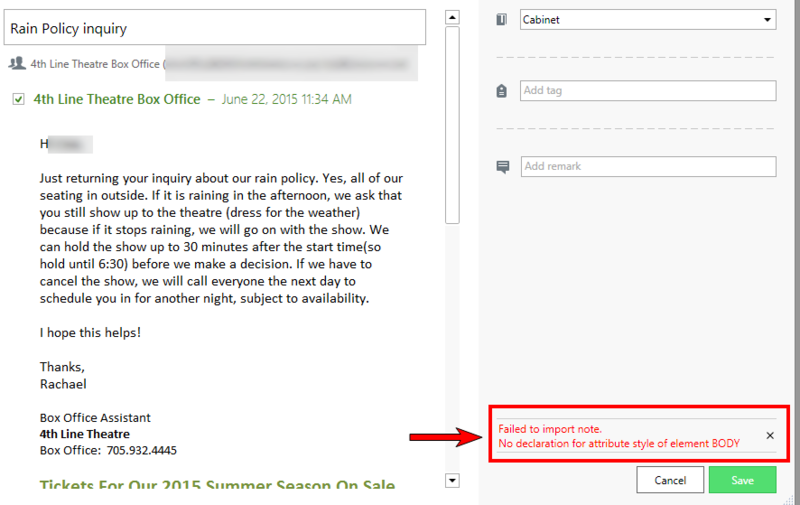 Please tell me a solution for batch clipping within the Outlook add-on is being addressed ASAP! This one function gave me a TON of peace knowing I could file away emails and tag them and place in notebooks. It would take me most of my day to do this one email at a time. Though the clipper was moody, it is a great deal more efficient then one at a time. HELP! This change was by design, and our developers have stated that they're working on bringing it back. I apologize for any inconvenience. My sincere congratulations to you sir for being completely honest, and for Evernote developers responding to their users. I think this is the first time I have ever seen Evernote publicly admit that they made the wrong design choice, and then reversed themselves. This is really great! I hope to see more of it. Or less of it assuming viewer design choice mistakes. The clipper is amazingly slow. I actually prefer this version over the newest one, 5.9.1. The tables here are at their prime, before they were ruined in 5.8.9 and up. I really missed being able to add a table inside a table. Bring these tables back! The only thing I dislike about this update (which seems like it has been part of EN for much longer than a few months), is that the little blue indicator for new changes is missing. Seems this feature was actually added in 5.8.9.